I love doing reviews of brands that are really hyped that also give away a lot of free stuff to "influencers" because I am always dying to know are they really that great or do bloggers think they're great because they got it for free (and it's their 'job' to promote the brand). And Outdoor Voices seem to fit that description to a tee. Well here's an unadulterated review of their items from someone who paid for their items. Outdoor Voices first came onto my radar via social media and because of their claims for sustainability and transparency. And for the most part, it sounds like it's true. Their practices seem comparable to that of Everlane's and Grana's. You know they're at least trying so that's good. I went to their store located in San Francisco since 1) I was already in the city for a dentist appointment and 2) I'm making an effort to visit brick and mortar stores when possible to cut down on my waste of packaging from online deliveries. Also this way I could try their whole line-up without having to spend a fortune first (because believe me, their stuff ain't cheap). I tried a variety of stuff. But first up: their Textured Compression leggings. These are the bulk of their items (they only have 2 types, this one or the Tech Sweat which is up later). These are the ones you see in 99% of their ads, that come with cute muted colors and chevron patterns. In the pics below I'm wearing the 3/4 Leggings in Blue Quartz. The 3/4 length is perfect for my 5'4" frame and for taller people you probably want to get the 7/8 length (unless you're looking for cropped leggings). I'm wearing a medium (I'm usually a size 4-6). I tried the small but the compression was too uncomfortable for standing so nevermind trying to workout in them. And I'm wearing the tri-tone slash-back crop in a small (I'm a 36A on top). I love the color coordination and the overall color palette that they use. I've never really liked that workout clothes were traditionally made with really bright colors or black. The fit was good and I do think the leggings held me in and were flattering. But here's the secret I learned from the sales associate, their Textured Compression stuff doesn't "breathe" very well so if you're planning to do some serious sweating in your workout gear (which for me is a 'duh') then you're not going to want to get these. When I heard that I was like 'whaaaaat?' lol. So basically the Textured Compression is meant for walking your dog, hiking, and not-hot yoga, which means it's meant to be athleisure with an emphasis on the leisure. So since I plan to actually work-out in my workout clothes, the sales associates pointed me towards their Tech Sweat stuff. Now this is what I'm familiar with. It feels like my usual Nike and Lululemon leggings thats made of a smooth non-matte material and with a lot more stretch. Above, I'm wearing the Tech Sweat 3/4 leggings and Steeplechase bra (which is made from Textured Compression, but I liked it because it has removable cup inserts). 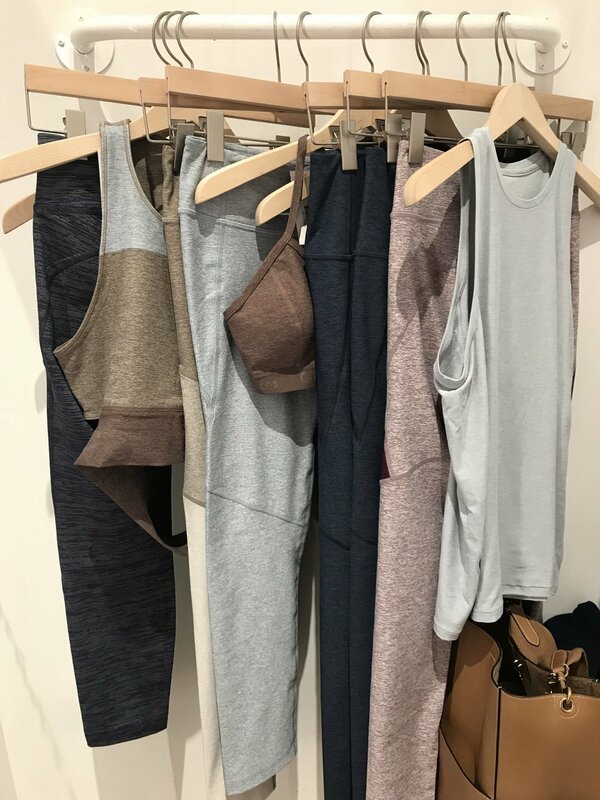 I ended up purchasing the outfit in the pic above (the Tech Sweat leggings and Steeplechase bra) mostly so that I can give an accurate review if I'm being honest. I actually have more than enough workout gear from a Lululemon binge from 3 -4 years ago, and I love my Lulus a lot (more than these Outdoor Voices leggings and bra). But after reading this blog post from To Universe with Love (scroll down to #77, #78 and #81 where she talks about reviews), I was inspired to do even better with my reviews. So I decided to make it a fair review I need to buy these items and use it. So I've been putting them through it's paces at the gym. I've been loving the leggings fine, (though I find them to be a bit slippery when trying to do the tree-pose in hot yoga) but I've not reached for the bra after using it once. The Textured Compression is just not a favorite for me so I just find myself reaching for my old reliable Lulu sports bras. It's just too compressive or maybe I should have sized up for a more comfy fit (which is actually what I did for some Lulu bras). Anyway If you're interested in trying them out, here's a $20 off referral link for first-time buyers (if you purchase more than $100, which if you want to buy a bra and leggings you will definitely exceed that threshold). I also get $20 if you use that link, but use it or not I don't really care (because I'm not sure I would purchase anything from them again. If I do get referral promo codes then I might do giveaways with them like I do M.gemi's $50 referral bonus). But if you want to try it for yourself at least you can get some $$ off. And if you do, let me know what you think! Anyone else try Outdoor Voice before? P.S. I just found out that I get $20 off my first $100 purchase too by referring people, which is pointless since I've already purchased from them. Leaving this referral link up for those who want $20 off but seriously this referral program is useless and lame for the referrer (this also means there's no point in giving out the codes I do "earn" since you still have to be a first time buyer to use it).